Thousands of Tube passengers have endured delays because of strike action over planned job cuts and ticket office closures. The first of two planned 48-hour strikes by the RMT and TSSA unions means there is a limited Tube service until Friday morning. Unions have said they will take part in talks on Friday aimed at resolving the dispute. 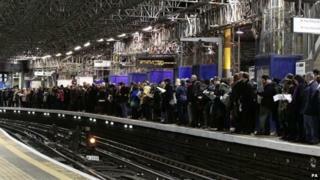 But London Underground (LU) urged them to meet earlier and suspend the strike. A second 48-hour walkout is due to begin at 21:00 GMT on 11 February. RMT leader Bob Crow said: "Our negotiators are geared up and ready to enter the exploratory talks on Friday. "In the meantime, the current action continues with the rock solid support of our members and we will be back out on the picket lines early in the morning as the strike heads into its third day." LU managing director Mike Brown said he welcomed the unions' decision to return to conciliation service Acas, but added: "Why wait till Friday? "I call on the leaderships of the RMT and TSSA to meet us on Thursday and to suspend the strike so we can get on with talks to resolve this issue and avoid any more unnecessary disruption to Londoners." Deputy prime minister Nick Clegg has added his condemnation to the industrial action. He said he did not think there was "any justification for the vast disruption". Transport for London (TfL) said services on Wednesday were running on most lines. Transport commissioner Sir Peter Hendy said 86% of Londoners who usually paid for travel using their Oyster cards had done so as normal. But the TSSA disputed this claim, arguing the service had been reduced by 70%. TfL says its proposed changes, which will lead to 960 job losses - but none compulsory - will modernise systems and save £50m a year. Mr Hendy added that many of the jobs, such as those in booking offices "were not worth doing" because of other payment options. If staff adapted and changed they would have a "job for life", he said. The industrial action, which began at 21:00 GMT on Tuesday, comes as the government said it was considering plans to declare London Underground an essential service in order to curb the threat of future strikes. Were it to happen, London Underground would be subject to a "minimum service agreement" under which staff would be required to keep a core level of trains going regardless of any industrial action. Government sources have told the BBC that the Conservative Party is considering including the proposal in its manifesto for the next general election. Labour MP Jeremy Corbyn called on the mayor of London to ensure there was "real engagement" with the unions before next week's planned strikes. Mr Corbyn said the Boris Johnson and the government were more interested in pursuing an "anti-union" agenda. The two sides have traded accusations over the negotiation process. TfL's Mike Brown told the BBC: "It's difficult to consult with an empty chair, which is the situation we've faced over the last several weeks." But Mr Crow rejected the claim, saying: "It's nonsense to say TfL have been negotiating with an empty chair. There have been two weeks of talks and RMT has attended every session, as Acas will confirm. "We have always had job cuts, it is the way you go about it", he said, before asking the mayor to "do the honourable thing and meet with us". Mr Johnson described the industrial action as "pointless and unnecessary" and reiterated his call for a ban on strikes affecting London transport, unless it was supported by more than 50% of union members eligible to be balloted. "That would be reasonable for vital transport functions, such as the London Underground, which has to keep the greatest city on earth moving and on which millions of people will depend for their livelihoods," he said. He later met staff and commuters at London Bridge station. In the Commons, Prime Minister David Cameron "unreservedly condemned" the strike and said Labour leader Ed Miliband ought to do the same. "We need a modernised Tube line working for the millions of Londoners who use it every day. "The fact is only 3% of transactions now involve ticket offices so it makes sense to have fewer people in those offices but more people on the platforms and the stations. "So I unreservedly condemn this strike." But when Mr Miliband did not comment, Mr Cameron said: "Isn't it interesting that with six questions and an invitation to condemn the strike, not a word?" On Tuesday, Mr Miliband said it was "deeply regrettable" that no negotiations or meetings with the mayor and TfL seemed to have happened. What's the Tube strike really about?